Michael Brophy’s newest exhibition revisits themes he first explored early in his career. 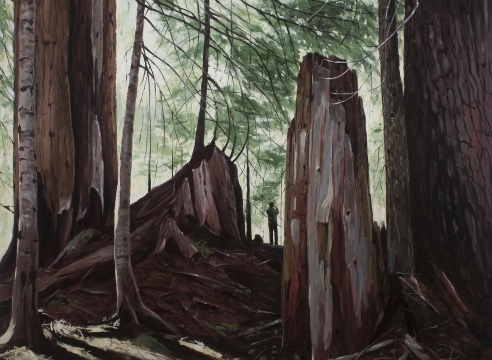 Forest and Clearing looks at the Northwest landscape and our human relationship to it, whether in the context of recreation or industrial use: presenting awe and wonder in the midst of beauty or destruction. While this is subject matter he has worked with before, Brophy’s formal interests of more recent years influence the way he looks at and paints a familiar subject. His use of color and light and his organization of space give a nod to the stacked shipping containers, or piled coastal jetties that he has painted in more recent years. This latest work will captivate viewers as they are pulled into the places he paints while simultaneously emphasizing the compelling virtuosity that Brophy has in applying paint to canvas. Northwest artist Michael Brophy graduated in 1985 from the Pacific Northwest College of Art, where he has also taught. He has shown extensively in the Northwest in both solo and group exhibitions. His work is in collections including Microsoft, the Multnomah County Library Collection, the Portland Art Museum, the Seattle Art Museum, the Tacoma Art Museum, OSU Library in Corvallis, The Coos Art Museum in Coos Bay, OR, and the City of Portland, OR. Public commissions include Portland’s City Hall, the Columbia Gorge Discovery Center in Wasco, OR, and Mt. Rainier High School in Des Moines, WA.